"On a global scale, 10% of medicines are substandard or falsified, with figures above 40% recorded in Asia and Africa"
The concept of counterfeit materials has existed for millennia. Indeed, counterfeit money is almost as old as money itself, and counterfeiting has been referred to as "the world’s second oldest profession". Before paper money was introduced, counterfeit coins were produced by mixing silver or gold with base metals. The edges of a coin were shaved and mixed with other metals to produce a counterfeit. When paper money was introduced in China, it was necessary to station guards around forests of mulberry trees from which the paper money was made, in an effort to prevent the production of counterfeits. However, the phenomena of counterfeit materials does not stop there. Counterfeit medicines have made it into the pharma industry internationally, where they are being produced and sold with the intent to deceptively represent their origin, authenticity and effectiveness. Counterfeit medicines may contain unspecified and illegal substances, also known as adulterants, as well as the wrong dosages. Furthermore, the packaging may state the wrong or no active ingredients. The term "counterfeit" is defined as a trademark violation under trade rules on intellectual property. However, the World Health Organisation (WHO) replaced the term counterfeit in 2017 with the phrase "substandard or falsified". By extending this definition, medicines which have legitimate ingredients but incomplete, missing or falsified paperwork are also included. On a global scale, 10% of medicines are substandard or falsified, with figures above 40% recorded in Asia and Africa. In 2016, more than 600,000 dosage units of false or substandard medicines were detained by Irish authorities. To ensure that substandard medicines do not enter the usual supply chain, the EU mandated the establishment of the Irish Medicines Verification Organisation (IMVO). This not-for-profit organisation works with hospitals and pharmacies around the country with the aim of providing a secure system of verification, whilst also retaining patient confidence in the medicines received. In addition, the European Commission published a new directive to safeguard public health and prevent falsified medicines infiltrating the pharmaceutical supply chain. The Falsified Medicines Directive (Directive 2011/62/EU), which came into effect across Europe from February 2019, requires safety features to appear on the packaging of medicines to further distinguish genuine medicinal products from falsified products. These safety features include anti-tamper packaging and a 2D barcode. While many medicinal products already feature anti-tamper packaging, this new directive will make this mandatory for originator and generic pharmaceutical companies and parallel distributors. In Ireland, falsified medicines have not been detected through legitimate supply channels to date, and instead are normally sourced from illegal websites. This is a major problem in Ireland as false sedatives, analgesics and anabolic steroids have been detected, as well as medications for erectile dysfunction and weight loss. Sibutramine, which was sold under the brand name "Reductil" among others, is an appetite suppressant, which has now been discontinued in many countries. It was associated with an increase in cardiovascular events such as heart attacks and strokes. Moreover, many falsified dietary supplements often contain undeclared sibutramine. As part of an Interpol-led operation last year to crack-down on counterfeit medicines here, approximately 30,000 units of anabolic steroids were seized. This operation, known as Operation Pangea, also saw the seizure of sedatives, analgesics and drugs to treat erectile dysfunction. Overall, the operation resulted in the seizure of 10.1 million dosage units, with an estimated value of $14 million. The WHO recently reported that fake leukemia medicines were in circulation in Europe and the Americas. This drug was packaged to look like "Iclusig", a cancer medicine used to treat chronic myeloid and acute lymphoblastic leukemia in adults. 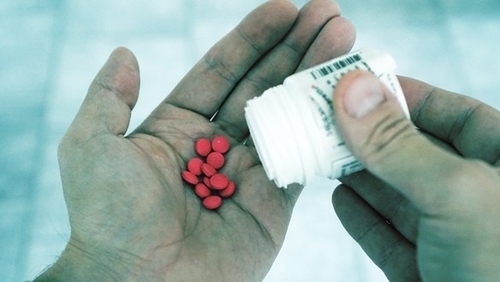 Fake cancer medicines are incredibly dangerous to cancer patients and lead to false hope. In 2014, vials of trastuzumab, licensed for treatment of breast and gastric cancers, were stolen from Italian hospitals. These vials were tampered with and re-introduced into the pharmaceutical supply chain under false credentials by unauthorised wholesalers, believed to be a criminal organisation connected to Italy. The falsified vials were discovered in the UK, Germany and Finland. Analysis of the falsified vials found that many had been diluted, while others contained no active drug. While the affected medicines did not ultimately reach patients, falsified cancer medicines could have tragic consequences. "False sedatives, analgesics and anabolic steroids have been detected in Ireland, as well as medications for erectile dysfunction and weight loss"
Falsified medicines pose a challenge to overall global health and can contribute to the global crisis of antimicrobial resistance. The exposure to low levels of antibiotics can result in the development of antibiotic resistance. Bacteria exposed to, but not killed by, an antibiotic can mutate and become resistant. Falsified medications, which can contain lower amounts of active ingredients than on the label, can contribute greatly to this problem. A sub-therapeutic dose can kill susceptible bacteria, but leave the slightly more resistant microbes behind. These antibiotic resistant bacteria grow freely, multiply and cause infection. The result is that certain antibiotics become ineffective to treat certain antimicrobial infections and hence, the success of major surgeries and cancer chemotherapy may be compromised. As counterfeit medicines become more sophisticated and difficult to detect, extra measures recently introduced in the EU can serve to protect public health against these substandard medicines. With the rise of counterfeit medicines in the past couple of years and the increase in online shopping, there is a heightened danger that medicines sourced online may not be genuine. Caution is advised to the general public so as to not become victim of counterfeit and falsified medicinal products. David Walsh is a postdoctoral researcher with the Synthesis and Solid State Pharmaceutical Centre (SSPC), the SFI Pharmaceutical Research Centre at Trinity College Dublin. Olivia Schmidt is a PhD researcher with the SSPC at University College Cork. Dipali Ahuja is a PhD researcher with the SSPC at the University of Limerick.